Not only does WPTools support printing of header and footer texts, these texts can also be edited in page layout mode. WYSIWYG editing of headers and footers in page layout mode. Exclusive editing of a header or footer text in normal layout mode. Different headers and footers for the first page or for odd and even pages. Different set of headers for any section in the text. Event OnGetSpecialText to select a header or footer using your own program logic. Undo logic logs also the changes made to header and footer. Event OnGetSpecialText makes it possible to select an individual header or footer for each page in the document. In certain page layout modes the headers and footers can be edited WYSIWYG. In header and footer it is also possible to place graphics. If you choose the graphics to be “free floating” you can place it anywhere on the page and it will be displayed and printed under the regular text. The ManageHeaderFooter dialog makes it easy to create a header or footer. It has two buttons to switch between normal and page layout mode. 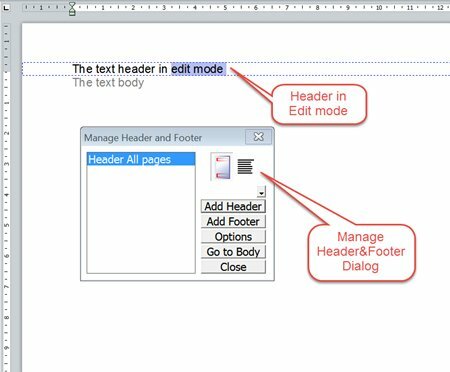 If the user selects a header which is not used in the document, automatically the normal layout mode will be activated to edit this header.